Continued from Stage 12 - page 2. Now leaving the old quarter there are a couple of religious buildings of particular merit that should be visited. The first is the Monasterio de las Huelgas which is about 20 minutes walk from the old town. 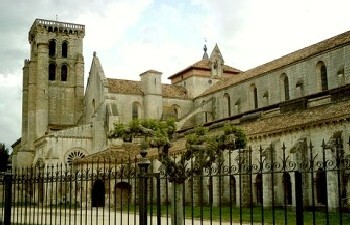 The monastery, founded by Eleanor wife of King Alfonso VIII of Spain and the daughter of English monarch Henry II and his wife Eleanor of Aquitaine, is still home to around 40 Cistercian nuns. Las Huelgas literally translated means “the reposes” and it was once a favourite place of retreat for the Castilian monarchs. The church was partitioned in the 16th century and a moving pulpit installed that would allow the Priest to address both the nuns and the general congregation at the same time. Also in the church you will find an unusual statue of Santiago holding a sword. You might say that there is nothing really unusual in that as there are hundreds of statues of Santiago as Santiago Matamoros depicting him with a sword in hand. The unusual thing about this statue is that the arms move. It is said that the statue was used in the coronation ceremonies of the Castilian kings. The coronation ceremony of the Castilian monarchs would involve them being knighted. Obviously, already being of the highest rank in the land there was no-one who could knight them, who better than the patron saint of Spain to perform this deed. Therefore statues of Santiago were made with moveable arms in order that they could be used to knight the monarchs. 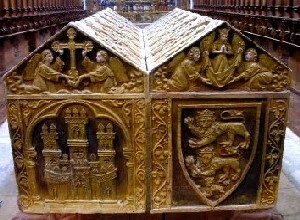 On the nun's side of the partition is the royal pantheon where you will find the ornate tombs of King Alfonso VIII and his wife Eleanor showing the heraldic arms of Castilla and England, King Enrique I and his wife Doña Berenguela, along with a number of other members of the Castilian royal family. Also in the grounds of the monastery can be found the Museo de Ricas Telas. This museum displays the remarkably well preserved clothing and jewellery found within the tombs when they were opened in 1942. The other monastery to visit is the Cartuja de Santa Maria de Miraflores. You can walk there but it takes around an hour from the centre of town and as you have already walked several kilometres it is recommended that you take a bus. 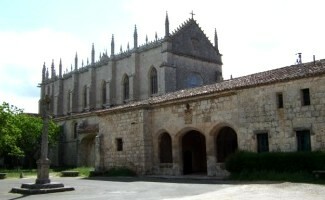 The monastery was built on the site of a former hunting lodge used by King Enrique III. After his death his son King Juan II de Castilla decided to donate the lodge to a Franciscan order but it was a Carthusian community which eventually established itself here. Unfortunately in 1442 the building was destroyed by fire. The King ordered that it should be rebuilt but regrettably did not live to see it completed, dying in 1454. The King's daughter Isabella, who was to become one of Spain's most revered monarchs Reina Isabel la Catolica, took over the building project. Like the cathedral in Burgos, this building was designed in part by Hans of Cologne. There is another link to the cathedral to be found in the church, the elaborate star shaped tomb of King Juan of Castile and his wife Isabel of Portugal. 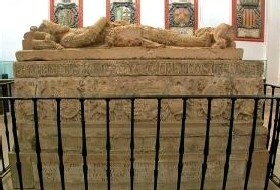 The tomb was commissioned by their daughter Isabel and was carved by Gil Siloé. Also lying close by is the tomb of Alonso XII, Queen Isabel's brother, the heir to the throne, who died at the tender age of 14. His tomb was also carved by Gil Siloé. 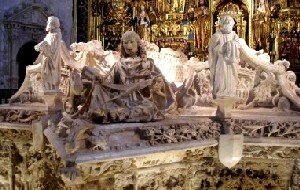 As mentioned before Burgos' most famous son Rodrigo Diaz de Vivar, known the world over as El Cid, a name he never used in life, is buried within the cathedral. However, his horse Babieca is entombed in the Monasterio de San Pedro de Cardeña about 10 kilometres outside the city. This monastery is also where El Cid and his wife Jimena had originally been buried. Unfortunately during the Napoleonic wars their bones were stolen and taken to France. There is an ornate tomb in the 15th century church marking the spot were they had been buried. The bones were later reclaimed from the French and were interred in 1927 in the cathedral. Most of us will have at some time or other seen the 1961 film El Cid starring Charlton Heston as El Cid and Sophia Loren as his wife Jimena. This film immortalises him as one of the great heroes of Spain but in reality this is only partly true. Born Rodrigo Diaz de Vivar in 1043 he became friends with King Sancho II of Leon y Castilla, serving him until the King's assassination in 1072. He then served King Alfonso VI as a general but the relationship was not a happy one. To begin with Rodrigo believed Alfonso to have had a part in the previous king's assassination and made the king swear, before god, that he had nothing to do with the death of his brother at the church of Santa Gadea in Burgos. Their initial friendship ended when the king banished him following the battle of Cabra near Toledo. The king believed Rodrigo had taken it upon himself to attack the muslim stronghold, when actually he was defending himself. Whilst in exile Rodrigo became somewhat of a mercenary, fighting for the man who would pay the highest price. This included fighting for the muslim army with Almutamán, king of Zaragoza. He was eventually reconciled with King Alfonso VI in 1086 when the King sent him to protect the Castilian interests on the east coast around Valencia. This was around the time that the Almoravid invasion was beginning. With a combined Moorish and Christian army Rodrigo lay siege to Valencia in 1093, first in the July and August and then again at the end of the year, with the city finally surrendering to Rodrigo in June of 1094. It is also believed that it is around this time that Rodrigo receives the Arab title of Sidi (my lord) which subsequently becomes El Cid. The Almoravid army, angry at having lost Valencia to the Christians continued to apply pressure resulting in numerous battles, most of which were won by El Cid. It is now where the story of El Cid is mixed with fact and fiction. If you believe the story given in the film, the Almoravids again besiege the city of Valencia and it is during one of the skirmishes that El Cid receives a fatal wound by an arrow piercing his heart. Upon hearing that their hero has been wounded the Valencian troop's morale drops so despite dying during the night, the following morning Doña Jimena orders that El Cid be strapped to his horse Babieca to lead his troops to battle. That way morale would improve as the troops believed that he still lived. Another story tells that he actually died of natural causes. I know which one I would like to believe. Either way Valencia was taken by the Almoravids in 1102 but before the city was taken, Jimena with the help of Alfonso VII, abandoned the city along with her family and followers of El Cid. They took Rodrigo's mortal remains along with them to be buried, along with his horse, in the grounds of the Monasterio de San Pedro de Cardeña. If you really want to explore the city in some depth the tourist office can be found close to the cathedral. Like any large city there will be plenty of hotels, hostels, pensiones and albergues to choose from dependant upon your budget. There are also a large number of restuarants, bars, cafés etc.